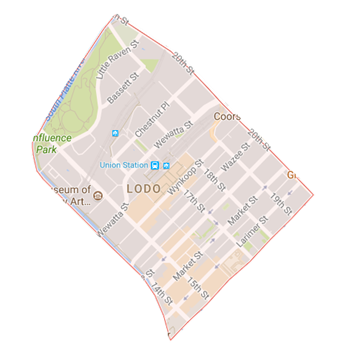 Lower Downtown, affectionately called "LoDo" by locals, is where it all started in Denver. As the original settlement and the oldest part of Denver, LoDo has become the spot for Denver's best entertainment and activity over the past 20 years. With around 100 bars and some of Denver's top restaurants, LoDo is where you'll find the best nightlife in Denver. During the day, coffee houses and store fronts are surrounded by some of Denver's most creative businesses, including ad agencies, architectural firms, and internet companies. The LoDo neighborhood also houses many Denver art galleries. Coors Field (20th and Blake) marks the center of LoDo and is a few blocks away from Larimer Square. The Lower Downtown neighborhood also includes an area just north of Coors Field known as Riverfront, a spot where you'll find those brave enough to kayak down the South Platte River. From Riverpoint, you can connect to a 40-mile bike trail full of bikers and hikers. With Union Station as an anchor, the city's RTD Light Rail line makes everything easy to get to in LoDo. A free shuttle is also available on 16th Street that connects LoDo to downtown Denver. LoDo offers plenty of sports and entertainment options. Walk to a baseball game at Coors Field (home of the Colorado Rockies), or basketball and hockey at the Pepsi Center (home to both the Denver Nuggets and Colorado Avalanche). Other entertainment and attractions in LoDo include the Museum of Contemporary Art Denver, Children's Museum of Denver, historic Union Station, and Elitch Gardens Amusement Park.